Download "Appendix A. 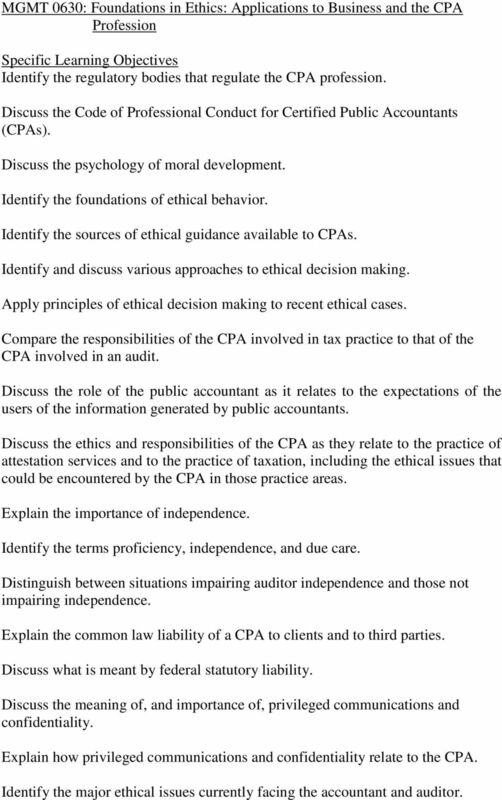 Specific Learning Objectives by Course"
2 MGMT 0630: Foundations in Ethics: Applications to Business and the CPA Profession Identify the regulatory bodies that regulate the CPA profession. Discuss the Code of Professional Conduct for Certified Public Accountants (CPAs). Discuss the psychology of moral development. Identify the foundations of ethical behavior. Identify the sources of ethical guidance available to CPAs. Identify and discuss various approaches to ethical decision making. Apply principles of ethical decision making to recent ethical cases. Compare the responsibilities of the CPA involved in tax practice to that of the CPA involved in an audit. Discuss the role of the public accountant as it relates to the expectations of the users of the information generated by public accountants. Discuss the ethics and responsibilities of the CPA as they relate to the practice of attestation services and to the practice of taxation, including the ethical issues that could be encountered by the CPA in those practice areas. Explain the importance of independence. Identify the terms proficiency, independence, and due care. Distinguish between situations impairing auditor independence and those not impairing independence. Explain the common law liability of a CPA to clients and to third parties. Discuss what is meant by federal statutory liability. Discuss the meaning of, and importance of, privileged communications and confidentiality. Explain how privileged communications and confidentiality relate to the CPA. Identify the major ethical issues currently facing the accountant and auditor. 3 Identify the licensing systems and disciplinary actions imposed by the profession and state regulatory bodies. Discuss the ethical nature of decisions in accounting and auditing. 4 MGMT 0633 Advanced Auditing Research and interpret relevant accounting and auditing standards including GAAS and other standards for attestation engagements Apply relevant research to practical accounting and auditing problems including understanding a client s business and industry including tone at the top, client acceptance, risk analysis, financial statement assertions and audit objectives. Analyze audit and control risk. 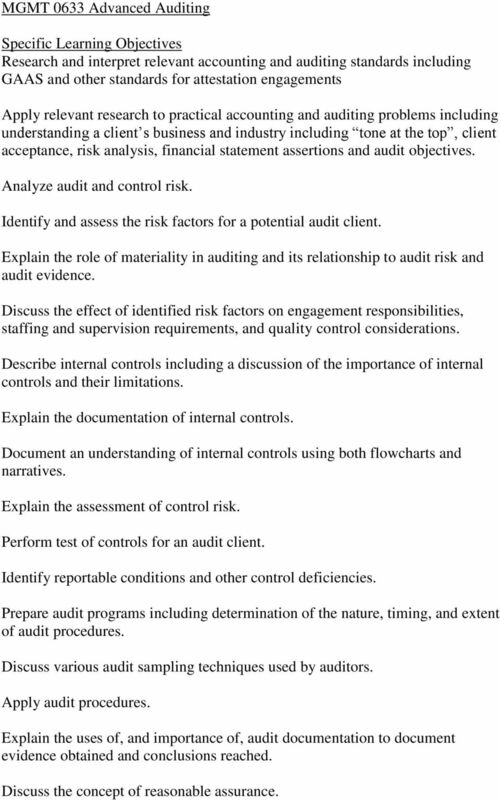 Identify and assess the risk factors for a potential audit client. Explain the role of materiality in auditing and its relationship to audit risk and audit evidence. Discuss the effect of identified risk factors on engagement responsibilities, staffing and supervision requirements, and quality control considerations. Describe internal controls including a discussion of the importance of internal controls and their limitations. Explain the documentation of internal controls. Document an understanding of internal controls using both flowcharts and narratives. Explain the assessment of control risk. Perform test of controls for an audit client. Identify reportable conditions and other control deficiencies. Prepare audit programs including determination of the nature, timing, and extent of audit procedures. Discuss various audit sampling techniques used by auditors. Apply audit procedures. Explain the uses of, and importance of, audit documentation to document evidence obtained and conclusions reached. Discuss the concept of reasonable assurance. 5 Evaluate the sufficiency and competence of audit evidence obtained to determine if audit objectives were achieved. Evaluate whether a client s financial statements are free of material misstatements. Prepare required audit reports including the independent auditor s combined report on the audited financial statements and the effectiveness of internal controls over financial reporting. Identify other reports that may be required by the auditor including communications with audit committees. Explain the importance of ethics and independence in auditing including their place in the AICPA Code of Professional Conduct. 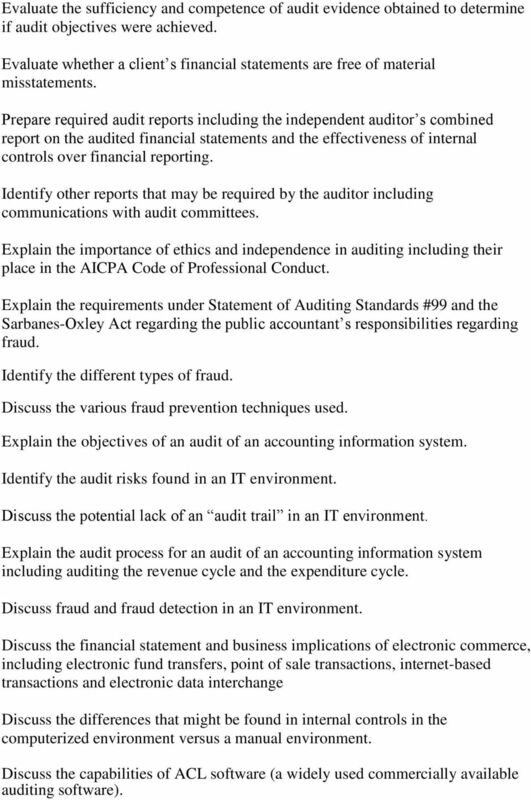 Explain the requirements under Statement of Auditing Standards #99 and the Sarbanes-Oxley Act regarding the public accountant s responsibilities regarding fraud. Identify the different types of fraud. Discuss the various fraud prevention techniques used. Explain the objectives of an audit of an accounting information system. Identify the audit risks found in an IT environment. Discuss the potential lack of an audit trail in an IT environment. Explain the audit process for an audit of an accounting information system including auditing the revenue cycle and the expenditure cycle. Discuss fraud and fraud detection in an IT environment. Discuss the financial statement and business implications of electronic commerce, including electronic fund transfers, point of sale transactions, internet-based transactions and electronic data interchange Discuss the differences that might be found in internal controls in the computerized environment versus a manual environment. Discuss the capabilities of ACL software (a widely used commercially available auditing software). 6 Identify the uses and limitations of Computer Assisted Audit Tools and Techniques (CAATT) including data interrogation, extraction, and analysis. Discuss the importance of oral and written communication skills in business. 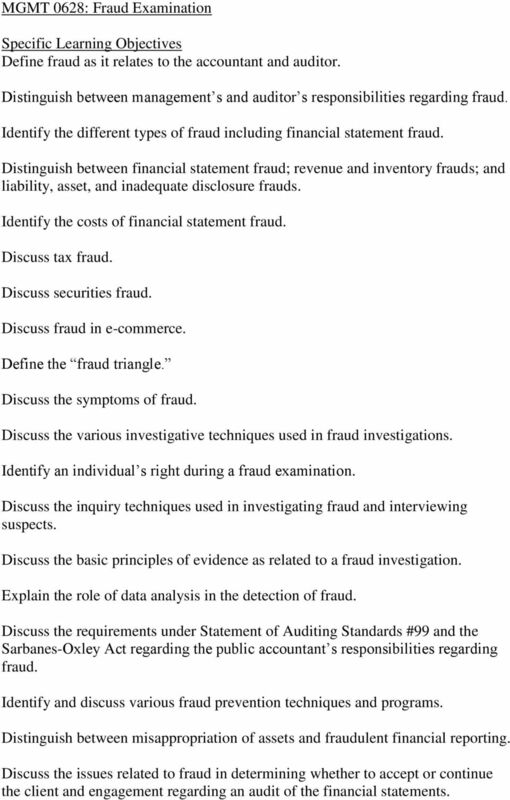 7 MGMT 0628: Fraud Examination Define fraud as it relates to the accountant and auditor. Distinguish between management s and auditor s responsibilities regarding fraud. Identify the different types of fraud including financial statement fraud. Distinguish between financial statement fraud; revenue and inventory frauds; and liability, asset, and inadequate disclosure frauds. Identify the costs of financial statement fraud. Discuss tax fraud. Discuss securities fraud. Discuss fraud in e-commerce. Define the fraud triangle. Discuss the symptoms of fraud. Discuss the various investigative techniques used in fraud investigations. Identify an individual s right during a fraud examination. Discuss the inquiry techniques used in investigating fraud and interviewing suspects. Discuss the basic principles of evidence as related to a fraud investigation. Explain the role of data analysis in the detection of fraud. Discuss the requirements under Statement of Auditing Standards #99 and the Sarbanes-Oxley Act regarding the public accountant s responsibilities regarding fraud. Identify and discuss various fraud prevention techniques and programs. Distinguish between misappropriation of assets and fraudulent financial reporting. Discuss the issues related to fraud in determining whether to accept or continue the client and engagement regarding an audit of the financial statements. 8 Discuss the assessment of engagement risk and the relationship of the risk of fraud to that assessment. Discuss consideration in the assessment of the risk of misstatements from errors, fraud, and illegal acts by audit clients. Discuss internal controls in both manual and computerized environments, and their effect of the assessment of the risk for misstatements from errors, fraud, and illegal acts by audit clients. Explain the limitations of internal controls in the prevention and detection of fraud. Identify the required communications by an auditor requiring errors, fraud, and illegal acts. Discuss the various ways fraud can be resolved and the legal follow-up that may be involved. Identify the issues and role of the auditor as an expert witness in a fraud investigation. Discuss the forensic accountant s role in the investigation and resolution of various types of fraud. 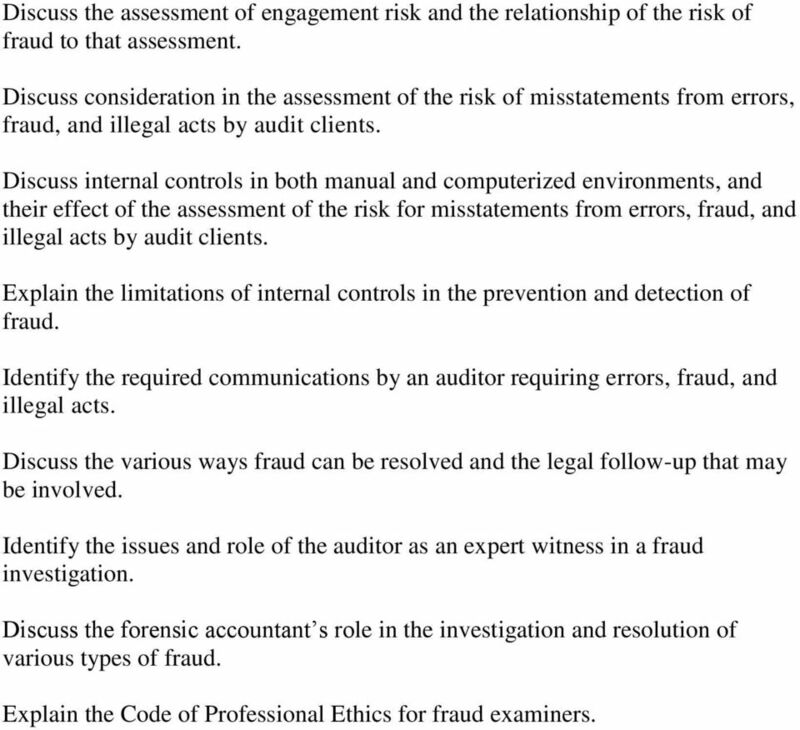 Explain the Code of Professional Ethics for fraud examiners. 9 MGMT 0632: Business Law for Accountants Discuss the advantages and limitations of the various legal structures for a business including sole proprietorships, general and limited partnerships, limited liability companies (LLC), limited liability partnerships (LLP), subchapter S corporations, and joint ventures. Explain the steps for forming a business. Identify the financial structure for each of the legal structures available for doing business including capitalization, profit and loss allocation, and distributions. Explain the rights, duties, legal obligations, and authority of owners and management under the various legal structures available for doing business. 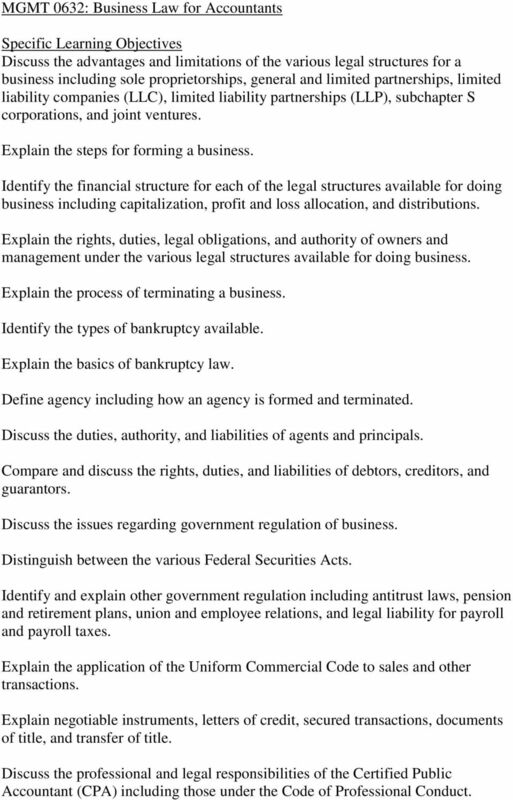 Explain the process of terminating a business. Identify the types of bankruptcy available. Explain the basics of bankruptcy law. Define agency including how an agency is formed and terminated. Discuss the duties, authority, and liabilities of agents and principals. Compare and discuss the rights, duties, and liabilities of debtors, creditors, and guarantors. Discuss the issues regarding government regulation of business. Distinguish between the various Federal Securities Acts. Identify and explain other government regulation including antitrust laws, pension and retirement plans, union and employee relations, and legal liability for payroll and payroll taxes. Explain the application of the Uniform Commercial Code to sales and other transactions. Explain negotiable instruments, letters of credit, secured transactions, documents of title, and transfer of title. Discuss the professional and legal responsibilities of the Certified Public Accountant (CPA) including those under the Code of Professional Conduct. 10 Discuss the legal responsibilities and liabilities of the CPA under common law and the Federal Securities Acts. Explain federal statutory liability of the CPA. Compare and contrast the responsibilities of the CPA regarding privileged communications and confidentiality to those of an attorney. Discuss real property transactions including title transfers, the land-lord tenant relationship, leases, and the landlord s liability. 11 MGMT 0635: Contemporary Professional Accounting Problems Identify the most recent accounting/auditing pronouncements and issues. Discuss issues involved in the effective implementation of recent accounting/auditing pronouncements. Discuss the problems associated with the use of comprehensive bases of accounting other than GAAP. Explain the current relationship between the various regulatory bodies including the PCAOB, FASB, SEC, AICPA, and the various state societies. Formulate an effective strategy to solve accounting problems. Define auditor independence, proficiency, due care, and ethics. Explain the importance of auditor independence, proficiency, due care, and ethics. Discuss the importance of the Code of Professional Conduct. Discuss the major components of the Sarbanes-Oxley Act. Discuss issues involved in the implementation of the Sarbanes-Oxley Act from both the financial accountant s and auditor s perspective. Discuss the licensing and disciplinary systems imposed by the profession and regulatory bodies. Discuss the legal responsibilities and liabilities of the accountant. Distinguish between the legal responsibilities and liabilities of the accountant in performing attestation services versus tax services. Discuss important considerations involved in the information technology environment of the accountant/auditor. Formulate an effective problem solving technique for approaching accounting problems such as those used in the C.P.A. and C.M. A. examinations. Understand the use and importance of the Financial Accounting Research System (FARS) database in research in accounting and auditing. Develop a familiarity with research tools including the FARS database. 12 MGMT 0636: Federal Income Taxation II Explain the administration of the tax law, including the audit process, by the Internal Revenue Service. Describe various taxes imposed in the United States at the Federal, state, and local levels. Explain the role of the legislature, the courts, and the Internal Revenue Service in the Federal tax system. Distinguish between statutory, administrative, and judicial sources of the tax law. Explain the history and trends of the Federal income tax in the United States as it relates to taxation of entities. Discuss the ethics involved in the field of taxation. Explain the role of the certified public accountant in the field of taxation v. the field of auditing. 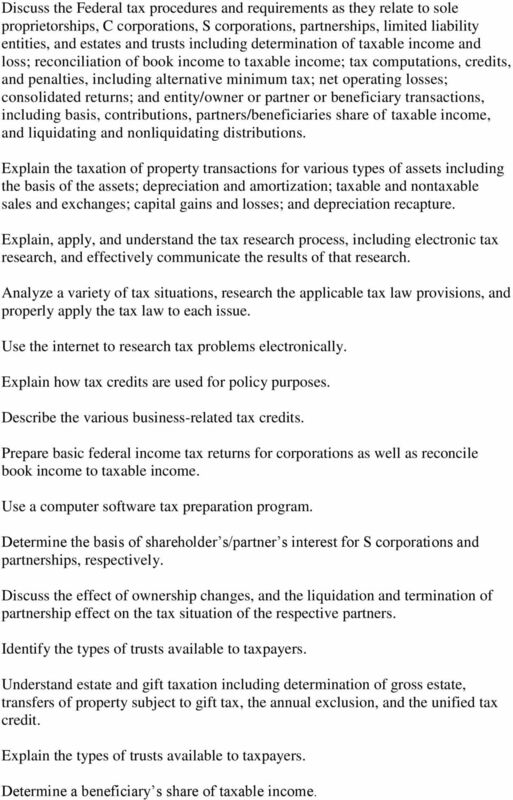 Explain the components of various tax structures such as the tax base and tax rates. Describe the economic, social, equity, and political considerations in developing a tax structure. Explain the similarities and differences in tax reporting for sole proprietorships, C corporations, S corporations, partnerships, and limited liability entities. 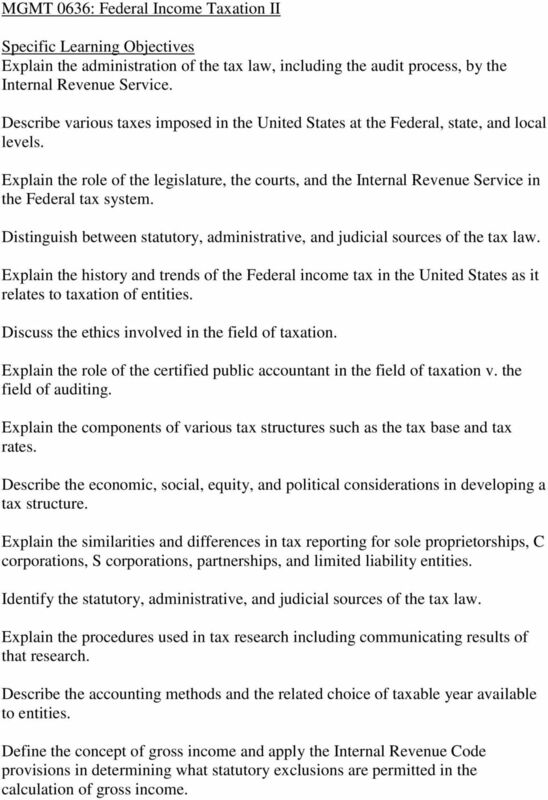 Identify the statutory, administrative, and judicial sources of the tax law. Explain the procedures used in tax research including communicating results of that research. Describe the accounting methods and the related choice of taxable year available to entities. Define the concept of gross income and apply the Internal Revenue Code provisions in determining what statutory exclusions are permitted in the calculation of gross income. 13 Discuss the Federal tax procedures and requirements as they relate to sole proprietorships, C corporations, S corporations, partnerships, limited liability entities, and estates and trusts including determination of taxable income and loss; reconciliation of book income to taxable income; tax computations, credits, and penalties, including alternative minimum tax; net operating losses; consolidated returns; and entity/owner or partner or beneficiary transactions, including basis, contributions, partners/beneficiaries share of taxable income, and liquidating and nonliquidating distributions. Explain the taxation of property transactions for various types of assets including the basis of the assets; depreciation and amortization; taxable and nontaxable sales and exchanges; capital gains and losses; and depreciation recapture. Explain, apply, and understand the tax research process, including electronic tax research, and effectively communicate the results of that research. Analyze a variety of tax situations, research the applicable tax law provisions, and properly apply the tax law to each issue. Use the internet to research tax problems electronically. Explain how tax credits are used for policy purposes. Describe the various business-related tax credits. Prepare basic federal income tax returns for corporations as well as reconcile book income to taxable income. Use a computer software tax preparation program. Determine the basis of shareholder s/partner s interest for S corporations and partnerships, respectively. Discuss the effect of ownership changes, and the liquidation and termination of partnership effect on the tax situation of the respective partners. Identify the types of trusts available to taxpayers. Understand estate and gift taxation including determination of gross estate, transfers of property subject to gift tax, the annual exclusion, and the unified tax credit. Explain the types of trusts available to taxpayers. Determine a beneficiary s share of taxable income. 14 Communicate tax issues and planning opportunities verbally and in writing. Discuss the professional and legal responsibilities of a certified public accountant (CPA) in the preparation of tax returns. Recognize ethical dilemmas and responsibilities of taxpayers and tax professionals in the interpretation and application of tax law. 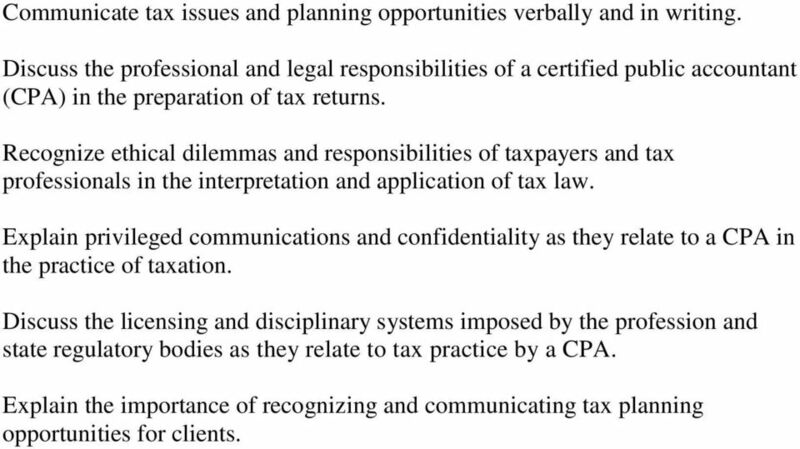 Explain privileged communications and confidentiality as they relate to a CPA in the practice of taxation. Discuss the licensing and disciplinary systems imposed by the profession and state regulatory bodies as they relate to tax practice by a CPA. Explain the importance of recognizing and communicating tax planning opportunities for clients. 15 MGMT 0622: Cost-Based Decision Making Compare and contrast strategic and operational planning. Identify and explain the various forecasting and projection techniques used in planning and budgeting. Discuss the importance of cost analysis in decision making. Discuss the role of budgeting in an organization. Explain budget variance analysis. Apply capital budgeting techniques for planning and control within an organization. Identify the factors affecting production costs. Distinguish between job costing and process costing. 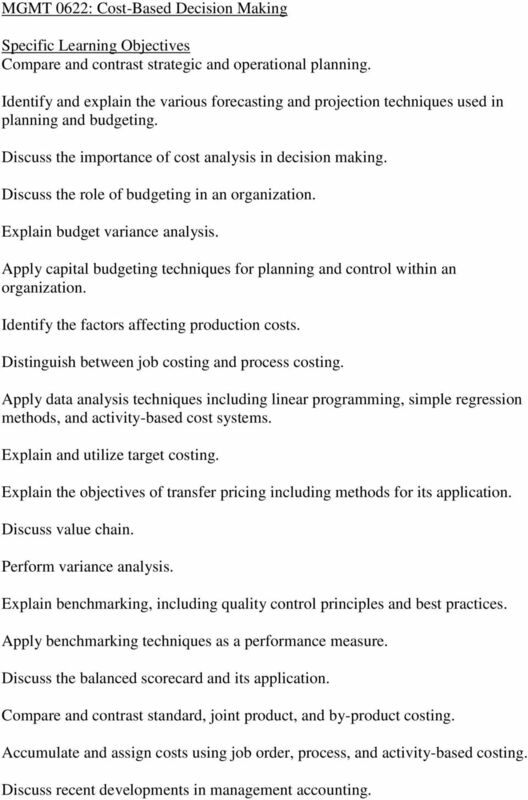 Apply data analysis techniques including linear programming, simple regression methods, and activity-based cost systems. Explain and utilize target costing. Explain the objectives of transfer pricing including methods for its application. Discuss value chain. Perform variance analysis. Explain benchmarking, including quality control principles and best practices. Apply benchmarking techniques as a performance measure. Discuss the balanced scorecard and its application. Compare and contrast standard, joint product, and by-product costing. Accumulate and assign costs using job order, process, and activity-based costing. Discuss recent developments in management accounting. 16 MGMT 0623: Decision Support Systems Compare and contrast strategic and operational planning. Identify and explain the various forecasting and projection techniques used in planning and budgeting. Discuss the role of budgeting in an organization. Explain budget variance analysis. Identify the factors affecting production costs. Discuss the role of Decision and other Management Support Systems. 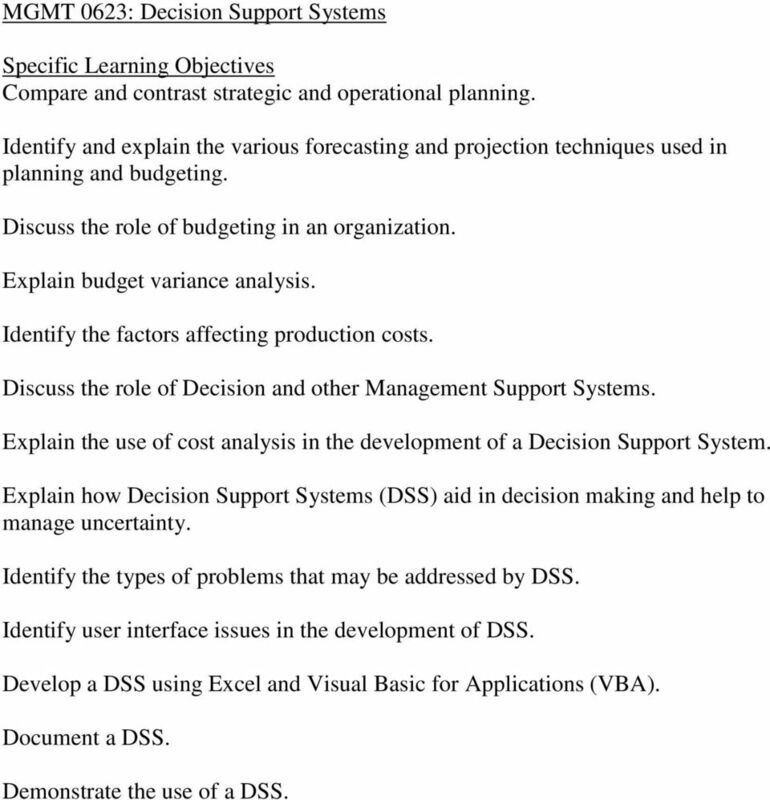 Explain the use of cost analysis in the development of a Decision Support System. Explain how Decision Support Systems (DSS) aid in decision making and help to manage uncertainty. Identify the types of problems that may be addressed by DSS. Identify user interface issues in the development of DSS. Develop a DSS using Excel and Visual Basic for Applications (VBA). Document a DSS. Demonstrate the use of a DSS. 17 MGMT 0624: Advanced Cost Accounting Compare and contrast strategic and operational planning. Identify and explain the various forecasting and projection techniques used in planning and budgeting. Discuss the role of budgeting, including capital budgeting, in an organization. Discuss the advantages and limitations of capital budgeting tools. Develop and present a budget using regression analysis. Explain budget variance analysis. Identify the factors affecting production costs. Understand cost-management information systems and implications of implementing those systems. Differentiate between job order costing, process costing, and activity-based costing. Perform an ABC-based product and customer profitability analysis. Describe profit centers, transfer pricing, and variance analysis. 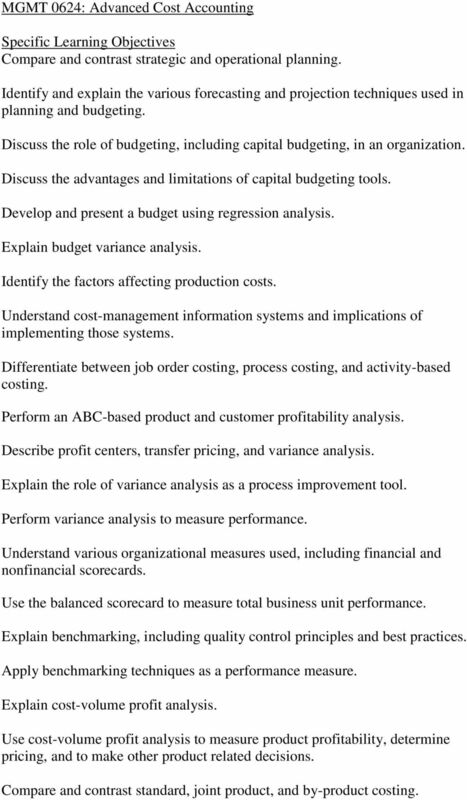 Explain the role of variance analysis as a process improvement tool. Perform variance analysis to measure performance. Understand various organizational measures used, including financial and nonfinancial scorecards. Use the balanced scorecard to measure total business unit performance. Explain benchmarking, including quality control principles and best practices. Apply benchmarking techniques as a performance measure. Explain cost-volume profit analysis. Use cost-volume profit analysis to measure product profitability, determine pricing, and to make other product related decisions. Compare and contrast standard, joint product, and by-product costing. 18 Apply inventory management tools to control inventory in an organization. Accumulate and assign costs using job order, process, and activity-based costing. 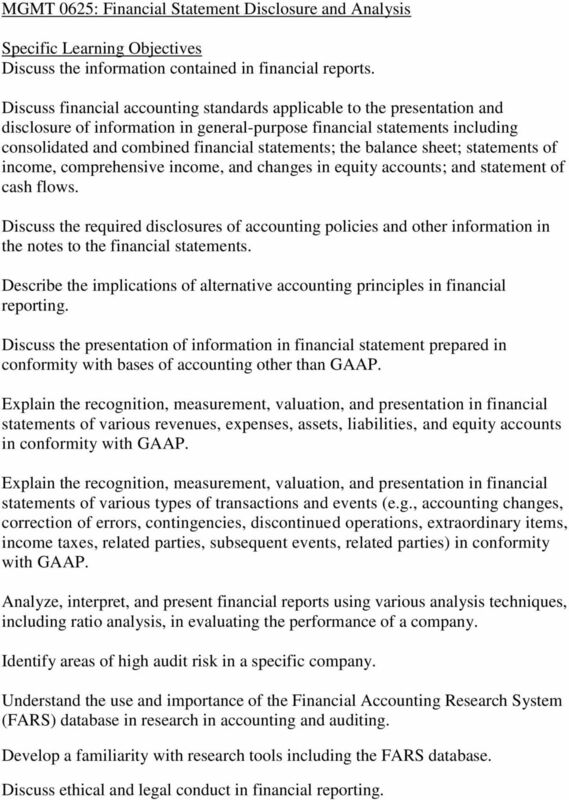 19 MGMT 0625: Financial Statement Disclosure and Analysis Discuss the information contained in financial reports. Discuss financial accounting standards applicable to the presentation and disclosure of information in general-purpose financial statements including consolidated and combined financial statements; the balance sheet; statements of income, comprehensive income, and changes in equity accounts; and statement of cash flows. Discuss the required disclosures of accounting policies and other information in the notes to the financial statements. Describe the implications of alternative accounting principles in financial reporting. Discuss the presentation of information in financial statement prepared in conformity with bases of accounting other than GAAP. Explain the recognition, measurement, valuation, and presentation in financial statements of various revenues, expenses, assets, liabilities, and equity accounts in conformity with GAAP. Explain the recognition, measurement, valuation, and presentation in financial statements of various types of transactions and events (e.g., accounting changes, correction of errors, contingencies, discontinued operations, extraordinary items, income taxes, related parties, subsequent events, related parties) in conformity with GAAP. Analyze, interpret, and present financial reports using various analysis techniques, including ratio analysis, in evaluating the performance of a company. Identify areas of high audit risk in a specific company. Understand the use and importance of the Financial Accounting Research System (FARS) database in research in accounting and auditing. Develop a familiarity with research tools including the FARS database. Discuss ethical and legal conduct in financial reporting. 20 MGMT 0626: Business Data Communications Explain the role of business information systems in transaction processing and management reporting. Identify current and emerging technologies in information technology used in business. Identify the risks associated with business information systems. 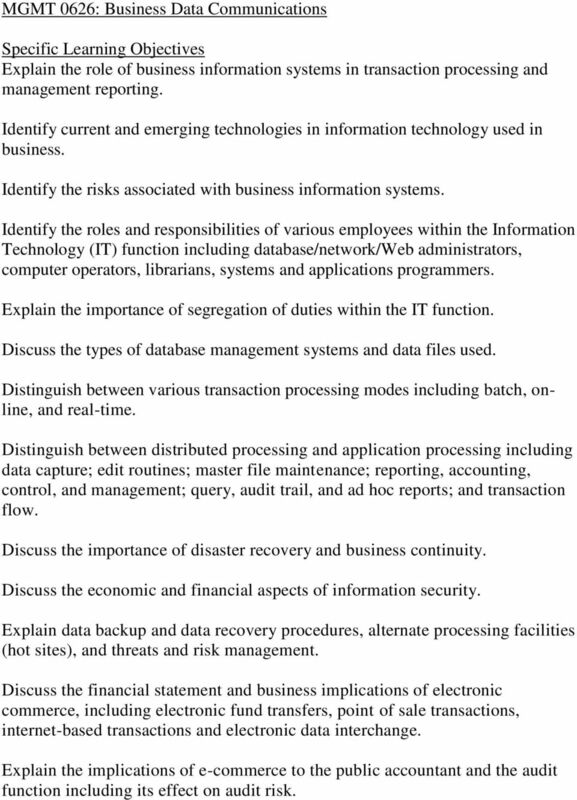 Identify the roles and responsibilities of various employees within the Information Technology (IT) function including database/network/web administrators, computer operators, librarians, systems and applications programmers. Explain the importance of segregation of duties within the IT function. Discuss the types of database management systems and data files used. Distinguish between various transaction processing modes including batch, online, and real-time. Distinguish between distributed processing and application processing including data capture; edit routines; master file maintenance; reporting, accounting, control, and management; query, audit trail, and ad hoc reports; and transaction flow. Discuss the importance of disaster recovery and business continuity. Discuss the economic and financial aspects of information security. Explain data backup and data recovery procedures, alternate processing facilities (hot sites), and threats and risk management. Discuss the financial statement and business implications of electronic commerce, including electronic fund transfers, point of sale transactions, internet-based transactions and electronic data interchange. Explain the implications of e-commerce to the public accountant and the audit function including its effect on audit risk. 21 MGMT 0627: Issues in Accounting for Public Companies Identify the interested parties in the governance of U.S. public corporations. Identify the regulatory agencies responsible for overseeing financial reporting by public companies. Explain the relationship between the various regulatory bodies in accounting and auditing. Discuss the requirements of reporting for public companies including: registration statements; proxy statements; 8-K, 10-Q, and 10-K reports. Discuss the political environment and independence requirements of the public accountant. Explain the legal liability issues for both accountants and auditors. Discuss the most recent accounting and auditing pronouncements affecting accountants and auditors of public companies. Identify recent accounting pronouncements affecting the information in the financial statements including recognition, measurement, valuation, disclosure, and presentation of such information (e.g., assets, liabilities, equity, related parties, correction of error, accounting changes). Develop teamwork and leadership skills in the research and presentation of a current topic relevant to accounting for public companies. Discuss the implications of the presentation of information using a comprehensive bases of accounting other than GAAP. 22 MGMT 0631: Municipal and Fund Accounting Analyze and account for specific transactions and events for governmental entities in accordance with Generally Accepted Accounting Principles (GAAP) including, but not limited to, net assets, capital assets, transfers between funds, financing arrangements, and encumbrances, revenues, expenditures, and encumbrances. Analyze and account for specific transactions and events for not-for-profit organizations in accordance with Generally Accepted Accounting Principles (GAAP) including, but not limited to, contributions and other revenues, restrictions, expenses, net assets, transfers between funds, financing arrangements, and investments. Explain the use of different funds (e.g., general and special revenue funds, capital projects funds, debt service funds, proprietary funds, and fiduciary funds) in recording transactions and preparing financial statements. Summarize the most current standard and reporting principles including the new reporting model. Discuss the nuances of the environment in which not-for-profit entities operate especially as compared to commercial entities. Identify the similarities and differences in financial reporting for not-for-profit organizations, including governmental entities, and for-profit entities. Explain the Single Audit Act. Understand government accounting concepts including fund accounting and the budgetary process. Discuss the importance of budgetary accounting and the budget process for government and other not-for-profit entities. Discuss the importance of operational effectiveness and efficiency including efficient use of resources. Prepare governmental and not-for-profit financial statements using the proper format including proper note disclosures. Discuss the similarities and differences between governmental and not-for-profit financial statements versus for-profit entities. Coordinate the preparation of a set of financial statements involving input from multiple areas. Discuss the similarities and differences between gvernment-wide financial statements, governmental funds financial statements, proprietary fund financial statements, and fiduciary fund financial statements. 23 Explain the process of converting from fund to government-wide financial statements. Identify the information included in the notes to financial statements and required supplementary information, including management's discussion and analysis. Explain the comprehensive annual financial report (CAFR). Analyze the financial statement of a not-for-profit entity and assess its financial condition. Enhance the ability to present and discuss financial information to a client. 24 MGMT 0634: IT Auditing Explain the objectives of an audit of an accounting information system. Explain the business processes found in an IT environment and the flow of information in that environment including those in transaction processing and reporting. Identify the roles and responsibilities of personnel found in the IT function. Identify the risks found in an IT environment. Identify procedures for management s risk assessment. Discuss the potential lack of an audit trail in an IT environment. Discuss the financial statement and business implications of electronic commerce, including electronic fund transfers, point of sale transactions, internet-based transactions and electronic data interchange Describe internal controls. Identify internal controls to prevent or detect misstatements in the computerized environment including adequate segregation of duties. Explain the limitations of internal controls. Explain the documentation of internal controls. Perform tests of controls in the IT environment. Assess control risk in the IT environment. Define continuous online auditing. Discuss the advantages and disadvantages of continuous online auditing. Explain the audit process for an audit of an accounting information system including auditing the revenue cycle and the expenditure cycle. Discuss fraud and fraud detection in an IT environment. Identify the uses and limitations of Computer Assisted Audit Tools and Techniques (CAATT) including data interrogation, extraction, and analysis. 25 Explain the capabilities of ACL software (a widely used commercially available auditing software). Apply the concepts of IT auditing using ACL software. Discuss adequate data backup and data recovery procedures. Discuss the assessment of a client s data backup and data recovery procedures. Document the audit evidence obtained. Evaluate the sufficiency and competence of audit evidence and document engagement conclusions. Discuss the review of subsequent events as related to the IT environment. Identify reportable conditions and other control deficiencies. Discuss the required communications and reports to satisfy engagement objectives. Identify matters for communication with audit committees. 26 MGMT 0637: E Commerce, or MGMT 0638: E Business Identify the elements of a successful e-business model. Describe the essentials of electronic commerce (e-commerce). Discuss strategies for marketing goods and services on the Internet. Describe the process of electronically buying and selling goods, services, and information on the Internet. Discuss cultural issues related to the Internet. Identify regulatory and ethical issues related to the Internet. Create strategies to deal with those regulatory and ethical issues identified. Identify the issues, from an accounting perspective, involved in moving business functions to the Internet. Explain the various methods for processing and reporting transactions in an e- business environment. Discuss ways to address those issues identified. Discuss the major opportunities, limitations, issues, and risks of e-commerce. Identify the audit risks and audit trail in an e-commerce/e-business environment. Discuss internal controls, including adequate segregation of duties, within an e- commerce/e-business environment. Explain the financial statement and business implications of electronic commerce, including electronic fund transfers, point of sale transactions, internet-based transactions and electronic data interchange Identify alternative for disaster recovery and processing to ensure business continuity including data backup and data recovery procedures. 27 MGMT 0640: Internship in Accounting Apply previously learned knowledge and skills in accounting and/or auditing in a practical environment. Acquire new knowledge and skills in accounting and/or auditing. Gain practical experience in accounting and/or auditing. Develop interpersonal skills in an accounting and/or auditing environment. Apply knowledge and experience gained in the internship environment to future career choice. Provide service to the host agency. CG Competency Framework 2010 cademic Year Revised July 2009 Contents Introduction to the CG Competency Framework.... 3. Purpose.of.the.Competency.Framework.... 3. Competency.Groups.....4. Required.Proficiency.Levels.....5. CPE Credits 7 Taxes. 8 Taxes. 6 Taxes. 8 Taxes. 8 Taxes. 7 Taxes. 8 Taxes. 7 Taxes. 9 Taxes. 9 Taxes. 6 Taxes. 6 Taxes. 9 Taxes. 8 Taxes.